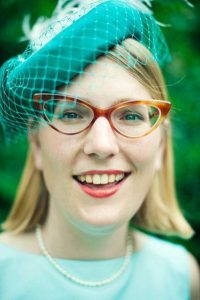 Sara h McIntyre is an illustrator and writer who is well-known for her marvellous stories and her pointy glasses and crazy hats. Sometimes she writes and draws picture books and comics herself, sometimes she illustrates books for other people, including Giles Andreae, Alan MacDonald, Gillian Rogerson, Anne Cottringer and Claire Freedman. Recently she has started making books with Philip Reeve. They both brainstorm the story ideas together, then Philip writes them and Sarah illustrates them. But occasionally they swap roles for a bit. And they love dressing up.